The day before the All-Star Game, the NECBL’s slugging percentage was .429 and the collective ERA was 5.16. Compare that to the League’s slugging percentage (.345) and ERA (3.58) in the 2010-11 summers, summers much more in line with a “normal” NECBL season. All of this makes Alex Haines’ summer that much more impressive. In a bizarre year of high-octane offenses, an unlikely hero emerged in the form of an under-recruited Division II lefty. At press time Haines had a 0.90 ERA and a commanding lead in that title. His 54 strikeouts also lead the NECBL. In his first 40 innings for the Vermont Mountaineers, Haines yielded just 30 walks or hits. Small wonder he got to start the All-Star Game, held in his home park of Montpelier’s Recreation Field. NECBL.com sat down with the 6’4” Western Pennsylvania sophomore, who won his Conference Pitcher of the Year this past Spring toiling for the Seton Hill Griffins. NECBL.com: Seton Hill is right in your hometown. Was that coincidence that you stayed close or did you want to stay close to home? NECBL.com: What has it been for you off the field this summer, being this far away from home? NECBL.com: What has been clicking for you this summer that has made you so effective? NECBL.com: You’re starting the All-Star Game tomorrow night in your home ballpark. Any thoughts on that? NECBL.com: What is it like facing the Division I hitters? A lot of D-II and D-III guys like the NECBL because it gives them exposure to “big” name schools. ...which means he'll play in Fenway. Cool, huh? I wrote a feature about David Carpenter last summer - he was the Mountaineer who was a catcher while with Vermont but became a relief pitcher when he hit the MLB farm system. He's had a great time in Houston and yesterday he was traded to from Houston to Toronto in a big trade involving seven players. The Astros traded pitchers Brandon Lyon, J.A. Happ and David Carpenter to Toronto for seven players, including pitcher Francisco Cordero and outfielder Ben Francisco, the team announced. Cordero’s is the only large contract the Astros received in the deal. He is signed for the remainder of the season on a one-year salary of $4.5 million, nearly counterbalancing what was left on Lyon’s three-year deal. Lefthander Dallas Keuchel was summoned to take Happ’s place in the Astros rotation and will likely start Saturday where Happ had been scheduled. Keuchel had a 2.45 ERA in four starts before the All-Star break during and just after Bud Norris’ time on the disabled list. Keuchel had been sent back to Class AAA when the Astros dropped back to a five-man rotation for the second half of the season. The Astros also get four minor league players: pitchers Joe Musgrove, Asher Wojciechowski, David Rollins and catcher Carlos Perez plus a player to be named later. For the past several seasons, Cordero has been one of the top closers in baseball. His 329 career saves rank second among active players to Mariano Rivera. In 794 career appearances, all in relief, he has a 3.28 career ERA and has reached 40 or more saves three times in his career. Prior to the trade, he was 3-5 with two saves in 41 appearances for Toronto this season. Francisco, 30, has a .259 career average with 45 home runs in 483 career Major League games with the Indians, Phillies and Blue Jays. He was hitting .244 (11×45) in 23 games for Toronto in 2012. Both Cordero and Francisco were in their first seasons in Toronto. The 19-year-old Musgrove (6-5, 230 lbs) was Toronto’s first pick in the first compensation round of the 2011 draft. In two appearances (one start) with Rookie Level Bluefield in 2012, he was 0-0 with a 1.12 ERA (1ER/8.0IP) with no walks and nine strikeouts. Musgrove made a combined nine appearances (seven starts) with Bluefield and Toronto’s Gulf Coast League club in 2011. Wojciechowski (6-4, 235), who is 23 years old and was Toronto’s first selection in the first compensation round of the 2010 draft, was 7-3 in 18 starts at Class A Dunedin this season with a 3.57 ERA (37ER/93.1IP) and 76 strikeouts. In his last seven starts, he was 5-1 with a 1.49 ERA (7ER/41.2IP). Wojchiechowski has an 18-12 career record in 46 minor league appearances (43 starts) with a 4.05 ERA. Rollins, 22, was 6-1 with a 2.78 ERA in 18 starts with Class A Lansing this season with 75 strikeouts in 77.2 innings pitched. The 6-1, 195 lb. southpaw was born in Deberry, TX and attended San Jacinto College North in Houston. Rollins, who was drafted by Toronto in 2011, has a 10-1 career minor league record in 25 starts with a 2.46 ERA with 104 strikeouts in 113.1 innings of work. Perez, 21, hit .269 in 70 games at Lansing with 21 doubles, five triples, five home runs and 40 RBI. In five minor league seasons (2008-12), he has a .279 career average in 332 games with 70 doubles, 24 triples and 11 home runs. For Houston this season, Lyon was 0-2 with a 3.25 ERA in 37 relief appearances, Happ was 7-9 with a 4.83 ERA in 18 starts and Carpenter, who is currently with Triple A Oklahoma City, was 0-2 in 30 relief appearances for the Astros with a 6.07 ERA. “It’s hard to give up Happ especially coming off an outstanding outing Monday against San Diego,” Luhnow said. “He’s shown at times this year why he was a great pitcher in Philadelphia and he’s been at times a great pitcher with us. He’s still young and under control and there’s a lot of value there. But we’re talking about picking up five minor league players that we like and we’ve got to give some value to get some value and in this case, Happ has a lot of value and we felt like that was the piece necessary in order to get what we got.” "
More than 26,000 pairs of eyes at Minutemaid Park watched him run out of the bullpen - three of those pairs belonged to his mother, father and girlfriend - but David Carpenter refused to look at any of them. He jogged up to the mound, collected his thoughts, adjusted the bill of his black Astros hat and went to work, staring directly - and only - at J.R. Towles' catcher's mitt. He pitched an inning of scoreless relief, striking out one. Houston went on to win, 7-0, snapping a five-game losing streak and an eight-game slide at home. When Carpenter made his Major League Baseball debut with the Astros in the eighth inning of the June 30 game against Texas, his lifelong dream had come true.One of the first stops along his journey from wielding a plastic Fisher Price bat, waiting for his dad to come home from work so they could play at age four, to pitching in an MLB game at age 26, was in Montpelier as a member of the 2005 Vermont Mountaineers. "You see a guy like him and you say, 'His arm's the best I've ever seen,' but his arm really is one of the best I've ever seen because he's made it to the major leagues," said current Vermont manager John Russo, who also coached Carpenter in 2005.But Russo did not get to see Carpenter pitch in a green and white Mountaineer uniform - Carpenter, up until June 2008, had been calling pitches behind the plate as a catcher. "I wish we had gotten a chance to see him pitch here," Russo said. "He had a great arm." Carpenter's 2005 Mountaineer experience included a trip to the New England Collegiate Baseball League final where he served as the starting catcher after playing his collegiate season as another Mountaineer - at the University of West Virginia. "When David was here, he was one of the best defensive catchers in the country at that time," Russo said. "You could tell he had a (great) arm from the minute you saw him. He maybe had one of the best arms I've ever seen from a catcher. He wasn't the best of hitters, but you knew he had a bright future. Now his most valuable tool has gotten him into the major leagues. "Carpenter was hosted along with a teammate by Fred and Ellen Connor and their school-aged children in East Montpelier. "Just how well we were received by the community," Carpenter said of what he remembers most about his summer in Vermont. "It was great to see the people come out to watch ballgames, and it was rewarding to be around good people up there who enjoy baseball and who enjoyed supporting us. We had a really good team, and that made things really, really fun. "Carpenter said his time in Vermont outshines the other nine minor league organizations he's played for. "Vermont was the best I could've asked for," he said by phone from Minutemaid Park prior to the Astros' game against Pittsburgh last Saturday. "The guys - we're a real tight-knit group - we're still in contact ... I played with Curt Smith (now with the Cardinals), and we shared stories about the same host families taking care of us. Without a doubt, it's something special up there. You'll come across some nice host families (in other leagues), but the people up there in Vermont are outstanding. I wish everybody could have a host family experience like I was able to have up there. "Carpenter spoke of cookouts with the Connors and spending time with other players' host families at various houses around central Vermont. "It was a real family atmosphere," he said. "We all just came off the college season, a big-time grind, and we were not sure what to expect, and we were taken in like one of the family. A lot of us hold those memories real close to our hearts. "Connor feels she and her family were infactthe lucky ones. "We saw (his debut) on YouTube, it was great," she said. "We're still absorbing the fact that he's in the big leagues. "Connor described Carpenter as a "typical southern boy" who was "very respectful. ""He called me 'ma'am,' which we're not used to up here," she said. "He was an only child, and this was definitely his dream. We're very happy to hear he's done so well. The Mountaineers did their part here, and who knows where he'll go. "Carpenter is one of 26 former Mountaineers who have made it to the professional ranks, and one of two to be housed by the Connors. Josh Satow, a left-handed pitcher who played for Vermont in 2006, is working his way up the Tampa Bay Rays' minor league system with the Advanced-A Charlotte Stone Crabs. "A lot of it deals with the fact that guys come there and are willing to work hard and put in the time to get better," Carpenter said of the success of Mountaineers' alumni. "John Russo, his big thing is to go out and play hard and play the right way, and you'll be successful... They pull the right group of guys to be successful there and down the road." Carpenter had 12 stints in the minor leagues with nine different teams since he left Vermont in August 2005 and was drafted by the St. Louis Cardinals in the 12th round of the 2006 June Amateur Draft as a catcher. His minor league stops included two in the New York-Penn League, the same league the Vermont Lake Monsters play in, with State College and Batavia. He had two stints in the Gulf Coast League (Cardinals), one in the Appalachain League (Johnson City), two in the Midwest League (Quad Cities), two in the Florida League (Palm Beach), one in the California League (Lancaster), and from there began his rapid ascent to Triple-A ball with a team in the Texas League (Corpus Christi) and the Pacific Coast League (Oklahoma City), where he was named a mid-season All-Star.During his second season with the Cardinals in June 2008, the parent team, the St. Louis Cardinals, signed then-four-year veteran catcher Yadier Molina to a five-year contract. That meant Carpenter and most of the rest of the catchers in the Cards' minor league system had even more time to wait to break into Molina's roster spot.So Carpenter was moved out from behind the plate and onto the mound - a switch he was not happy with. "It was definitely something I had to get used to," Carpenter said. "I didn't understand what was going on. I had progressed hitting-wise and catching-wise, and I had started to move quickly through the organization... The Cardinals had some success turning another catcher into a pitcher and they saw the same strong arm in me and wanted to see the change in me, too... The coaches explained the transition to me all the way down from why I would be successful and why it would help the organization. It was easier to take then, once it was explained to me. "For the rest of 2008, he posted a .184 ERA in 15 relief appearances, allowing 16 hits, nine runs (three earned), seven walks and striking out 17.Carpenter was traded to the Houston Astros on Aug. 19, 2010 for infielder Pedro Feliz. 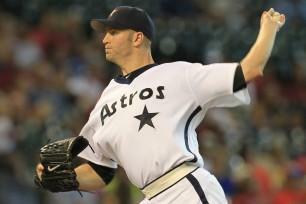 He pitched in 39 games in the Astros farm system before he got the call-up to the big time on June 29. He made his major league debut the next night. "It's way beyond what I've expected," Carpenter said. "It's so hard to describe. You have an idea of what it's going to be like, and when it's better, it's hard to put into words (when) you're in front of 30,000 people and on TV all the time and compete with the best in the world." Carpenter has made a total of five relief appearances for Houston. In 4.1 innings, Carpenter has allowed just one hit and no runs while striking out five. He struck out two in Pittsburgh on July 6 in front of the closest the Morgantown, W.Va., native can get to a hometown crowd. "(Pittsburgh) is about 90 miles from my hometown," he said. "People from my hometown have gotten a chance to see me play, and that means a lot to me and to them. They really expressed how much they wanted to see this dream come true, and they felt the same as I did about it. I definitely wouldn't be here without them. "But when did he realize he was "here"? "As soon as I was getting dressed that first time, I looked on the back of the jersey and I saw my name, I said, 'Hey, I'm here,'" he said. "Walking out to the bullpen as a group and seeing 25,000 people cheering, it was something really, really special. Unbelievable is the best way to put it. "Carpenter says his life hasn't changed a whole lot since his debut, and for him, that's the plan. "There really hasn't been much change other than a few more people know who you are," he said. "I've been on TV a few times, but as far as major changes, there haven't been any. I try to be the same person - it's what got me here - and I've got to be myself. There's no need to change that. "With one major life goal checked off the list, the next one is for all the marbles. "Now it's just a matter of staying in the big leagues, staying successful and helping the team however I can," he said. "Hopefully soon, when the opportunity presents itself, I want to win a World Series. That's what it's about now. I'm at the highest level possible, and now it's about winning and winning a championship." Carpenter and the Blue Jays just finished a series in Boston but will return September 7-9. The two teams will meet in Toronto for a three-game series the following week. The rosters arrived for the Twin State Lions Cup soccer games, to be held next Saturday, July 21, at Franklin Pierce University in Rindge, N.H., pitting the very best Vermont seniors against their counterparts from New Hampshire. Last year, the New Hampshire men won 2-1 while the Vermont women pulled a 2-0 shutout. Both games were played at Castleton State College. The Vermont men had were unbeaten in the previous three games 3-0, 3-1 and tied 3-3 while the women won in 2007 4-1, tied 1-1 in 2008, lost 4-2 in 2009 and won 3-2 in 2010. In all, the men are 12-17-8 while the women are 9-16-4. The funds raised from this event go to support the Lions Club intiatives, which for Vermont means supprt for the Austine Green Mountain Lions Camp, a summer camp for hearing impaired children. The 2012 team will be coached by U-32's Joe Ferrada, assisted by Paul Larson of Stowe, Kevin Ratti of Rutland and Katie Mack of Winooski. Jordan Hepburn will serve as manager. Local athletes playing for the Vermont men's team include Thomas Woolson of GMVS, Avery Cochran of PA, Guthrie Drake of Harwood, Jack Shea of U-32 and Billy Whaley of Northfield. Jim Eisenhardt, fresh off another Division III state championship with Peoples Academy, will coach the Vermont women. He will be assisted by Geri Witalec of BFA-Fairfax and fellow Wolves staff Carolyn Stames and Philip Kiely and Peoples Academy's Katie Stames and Hannah Merriam will serve as managers. Local athletes on the Vermont women's team including Harwood's Liza Mackey, Oxbow's Willow Smith and Reilly Johnson, Peoples Academy's Stacy Tomlinson and Kaleigh Newton, Spaulding's Hayley Arnold, Stowe's Marley Hauser and St. Johnsbury's Caroline Klosowski. Barre, VT –Thunder Road officials have announced that the winner of the Vermont Governor’s Cup 150 sponsored by the VT State Lottery Commission on this Thursday, July 12, will also earn an invite to the Bond Auto ACT Invitational at New Hampshire Motor Speedway on Saturday, September 22. Thunder Road’s marquee race of the summer will feature the top talent from Thunder Road, and the Vermont State Championship Series, all coming to town to claim the Vermont Governor’s Cup to be presented by Vermont Governor Peter Shumlin. Eight-time American Canadian Tour Champion Brian Hoar announced his last-minute entry to the race, trying for his third straight Thunder Road win, and second of 2012. Barre sensation Nick Sweet will have a target on his back entering a race where he has the best average finish (3.25) of any driver in the last four years. In his rookie year in the Late Model division in 2008, Sweet posted his worst Governor’s Cup finish of his career with seventh. He followed it up with a podium third-place finish in 2009, won the event in 2010, and ran second to Graniteville’s John Donahue in 2011 when he famously slowed down for a caution that never flew. Sweet enters the Governor’s Cup as the point leader, but will face stiff competition from defending Champion Dave Pembroke and multi-time track Champion Phil Scott, both of whom the Governor’s Cup has narrowly eluded. The Vermont State Championship Series will bring added pressure, as Milton’s Brent Dragon, Maine’s Ricky Rolfe, NH’s Joey Polewarczyk and more come to town as the Governor’s Cup serves as the third race of the four event series. Both Dragon and Rolfe, who are first and third in points respectively, enjoyed remarkable runs in the series opener at Thunder Road and expect more of the same on Thursday. For Phil Scott, the Governor’s Cup will be double trouble, as he currently sits second on the Vermont State Championship Series and fourth overall in Late Model points standings at Thunder Road. Qualifying for the Vermont Governor’s Cup presented by the VT State Lottery Commission will begin at 6:30pm this Thursday, July 12 at Thunder Road. Adult admission is $15, and kids under 12 will get in free. For additional information head to www.thunderroadspeedbowl.com , email us at media@acttour.com or call the Thunder Road office at (802) 244-6963. In a continued big week for Vermont pitching, reliever Matt McAllister was featured on the New England Collegiate Baseball League website, www.NECBL.com, along with college teammate Fred Briedenbach, who plays for the Danbury Westerners. The two won the Division II College World Series with the West Chester Golden Rams. Here's a link to the story by Don Leypoldt. Well it's about time. Vermont Mountaineers starter Alex Haines has been on a tear through the first half of the New England Collegiate Baseball League season and was named the league's latest Pitcher of the Week. The team hosts Keene tonight and tomorrow night and Danbury on Wednesday, all with 6:30 p.m. starts. Haines threw five shutout innings at Holyoke on July 3rd where he allowed only three base runners and struck out six in earning the win. He was lifted when Vermont had a 5-0 lead. The 6’4” lefty is the current NECBL ERA leader, having yielded just one earned run in over 23 innings. The Greenburg, PA product won the WVIAC Conference Pitcher of the Year this spring, having led the WVIAC with 108 strikeouts in 70 innings. Haines finished his school season with a 7-2 record in a team best 13 starts.